Visibility recommended that the company utilize key performance indicators to measure the health of their business. Implementing key performance indicators has the measurable benefits of streamlining operations, improving customer satisfaction, increasing revenues, and reducing costs to name a few. These measurements derive from the Company’s data and can be beneficial when that data can be easily accessed and presented in readable, user-friendly reports. Too often, the information that companies believe to be indicative of their business health is contained in spreadsheets that reside with various individual users. Hence, the information system itself (or lack of such a system) is viewed as a barrier to uncovering and consolidating the wealth of information created and controlled by different users. The strengths of Business Intelligence tools are their ease of use, flexibility, and ability to provide consolidated reports of data. Visibility’s data cubes in the areas of sales, accounts receivable, and accounts payable assisted the Company in measuring its key performance indicators (specifically, analyzing its cash flow and margin analysis for project orders and volume sales). Using data cubes to analyze data in the VISIBILITY.net system revealed that the margin on project orders was far greater than that on the volume sales. Valuable monetary and human resources were being utilized to support a line of business that was costing the Company far more money than the margin could realistically support. VISIBILITY.net had been the central repository for this data all along. Connecting Visibility’s Business Intelligence data cubes to the information contained in the VISIBLITY.net ERP system maximized the Company's return on investment by providing the Company’s management team with the reports and knowledge they needed to develop a strategy for advancing their highly profitable project orders line of business and modifying their low margin volume sales line of business. 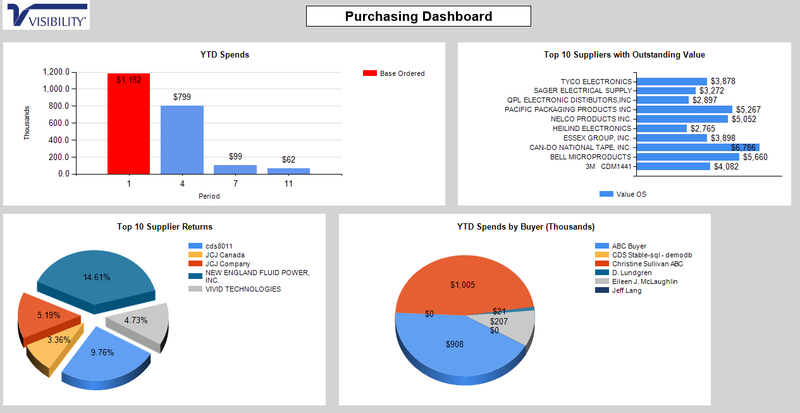 Visibility Business Intelligence solutions for finance, sales, purchasing, projects, inventory, labor, and work-in-progress/capacity planning are currently available. Click here to learn more about VISIBILITY.net’s solution.